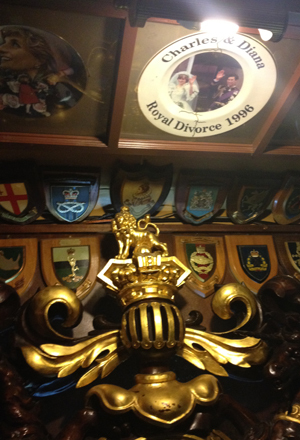 A rival pub owner described Windsor Castle to me as the cluttered basement of an eBay addict. He was talking about the little Windsor Castle pub near Edgware Station in London, which I should point out is not the actual castle where the British royal family lives. That is a different Windsor Castle. But this Windsor Castle is definitely worth a visit. The walls are covered with curiosities that seem at first glance to be dedicated to the House of Windsor, but also include collections of obsolete tools, celebrity photos, countless plaques, and—my favorite—a bas-relief of the exploits of Sir Francis Drake. The ceiling is covered with commemorative plates, which if you come from earthquake-prone Seattle can be a little unnerving. These plates are really where the royals get their best tribute. Kings and queens, princes and princesses, maybe a distant cousin or two. Having visited the pub in August 2012 (based on the “cluttered basement” recommendation), I was eager to return this year to see what sort of plate they had commemorating the July 22 birth of Prince George. But I couldn’t find one anywhere. Finally I asked the barman, who politely explained that it would be unbecoming to exploit the birth of a child with a plate. That was a private family matter, he said. 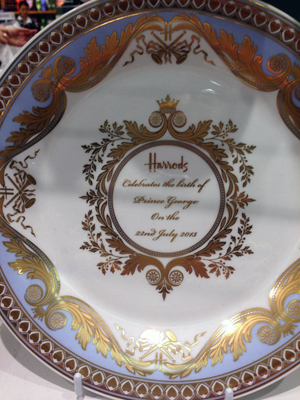 He said it standing below a plate commemorating the divorce of Charles and Diana—complete with a jagged painted crack. At Heathrow Airport a week later, my colleague found a plate celebrating the birth of Prince George of Cambridge and was kind enough to share the photo with me. Possibly it is too unbecoming for the hoarder’s museum. Also it is £30 new, and might still be too expensive on eBay.